Whether you are looking to swim a sprint distance or an Iron distance triathlon, having a few “goto” 1000 meter or 1000 yard freestyle workouts will help keep you from getting into a rut when training. For the long course triathletes, do these 1000 meter/yard sets 2 or even 3 times through to cover the distance needed in your training. You can use these sets to create mini projects or tasks to challenge yourself. It is a great way to stay engaged with your swimming and take control over your own training plan. 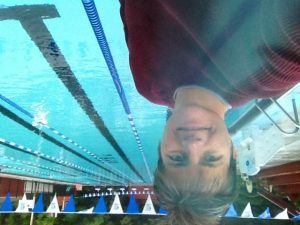 If you are looking for a main set that’s longer, such as 2000 or 3000 yards or meters, you can repeat the main set, or combine two of these into one practice. Suppose you’re looking for 2000yd main sets, you could take these three suggestions below, each at 1000 meters/yards and to them in any of 3 combinations (1 & 2, 2 & 3, 1 & 3). Rotate through these combos for a unique set of 3 main sets, each having a set that you do twice before taking a break from it. There are a lot of ways to customize this practice idea. For each of these swims you can choose some element to improve like…consistent SPL across all sets, or consistent tempo (use a tempo trainer). When you gain or if you already have good control, manipulate a variable…like 5 x 200 swimming the first 50 at one SPL, the next 100 at SPL + 1 and the last 50 at SPL + 2. This should result in a build within each 200. Vary the rest intervals to create a bit of variety. Since the 200s are more aerobic, keep the RI short in that practice. Since the 50s *can* be anaerobic, maybe choose to swim descending 50s with 30 sec rest, rest 2 minutes and repeat that 4 more times. Then you cycle back to the 5 x 200 set and have some comparison…choose 1 metric to try and improve. After 3 cycles of this…whether you swim every day, every other day or 2 times a week…you go back to your 1000yd TT and by that time you should KNOW before you swim it that you’ve improved based on metrics from the previous sets. Maintain Focus on Form and Skill During this time as well. Be sure to toss in at least 1 swim, possibly 2, of un-timed, form only swim sets, other strokes, or a team workout for variety. Or a water aerobics class. Comment below with how you are using these sets! 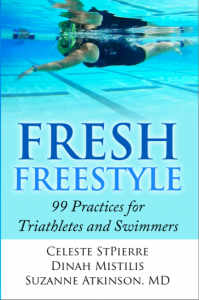 For more ideas on creating swimming improvement projects consider downloading this Fresh Freestyle Sampler for 3 practice swims from our book. Yesterday this interesting article in the Washington post discussed a study linking a decreased risk of falling to the activity of swimming. Men over 70 who had fewer falls also swam more than their counterparts. While the study does not identify a causal link, I have a few ideas that I think are worth sharing. Swimming may help improve Balance. Swimming may help improve balance and neuromuscular response, for additional reasons that are not discussed in this article. The horizontal orientation of swimming challenges the cerebellum & vestibular system in a different orientation than on land…without the risk of injury. Much like a baby learning to walk by falling, catching itself, trying again and again until it “learns” how to balance, a human body in the water is always falling towards gravity…without the impact. Every time the body rotates or changes its orientation there is an up/down shifting of the body in the water due to gravity…much like the body is “falling”. But as soon as buoyancy equilibrium is found, the body returns to neutral buoyancy. During these “falling” episodes, humans respond by kicking or flailing or sculling or lifting the head…they are in built reflexes. Overcoming those reflexes forces the vestibular system to deal with a new normal…an new sense of orientation. Whether a swimmer realizes it or not, swim time is “play time” for the brain and new pathways are be established. Like a baby learning to walk. A sense of “falling forward” when swimmers get to the positions that are better swimming positions, horizontally balanced head, shoulders & hips, is due to the vestibular system & cerebellum being used to a much more vertical orientation. If this sounds like you, try this curious experiment. Lay flat on a bed and let your chin be off the edge so you are looking at the floor…do you experience any vertigo? And if you do so then look right and look left a bit…how does that feel? 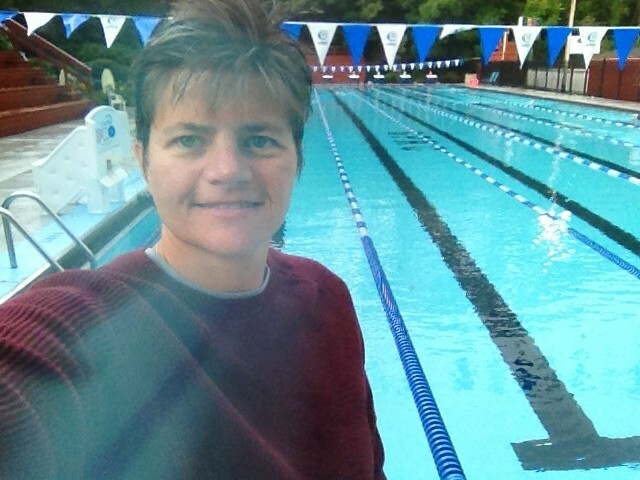 This is the position you should be in ideally in the water…body horizontal, head looking down & aligned cervical spine. Could be interesting to play with!! I’m fully convinced that every coach out there is doing their best to help their athletes improve. Drill recommendations are made based on their own knowledge, understanding, background and exposure to various coaching techniques. Great coaches pick up the best of what they are exposed to and add their own customizations based on their own personality. 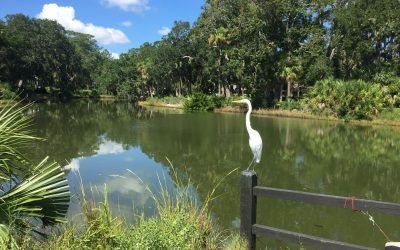 And as we learn, we discard old ideas, ones we may have previously thought were grand…in favor of a new, better or different way that seems to work better. SO here are my thoughts on better ways to do the freestyle swimming drill known as “side kicking drill”, “one arm extension drill”, “statue of liberty drill” or the older version of “skating drill”. all describe a similar body posture, but there are better ways for triathletes and swimmers to execute this and practice it well. 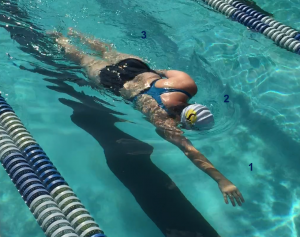 In this drill the body is rotated, head is looking down with nose/chin directed at the bottom of the pool, and the arm that is lower in the water is extended forward. This drill helps imprint the “slipperiest” streamlined position in swimming freestyle. However because full stroke freestyle is not a static activity, the most streamlined side kicking position is NOT the best position from which to initiate a freestyle stroke or recovery. It’s best to practice a body position that is in a better dynamic position to initiate the next stroke when ready. Here are three quick checks to make sure you’re doing it better. Rather than having the body rotated a full 90 degrees or with shoulders “stacked” one on top of the other, flatten the body’s rotational angle just a little bit so that the top shoulder comes closer to the surface. Belly button is pointed at the corners of the pool where the side walls meet the bottom, rather than the side of the pool. The lead arm and the head should have a small gap or separation between the shoulder and the chin rather than being resting or touching together. 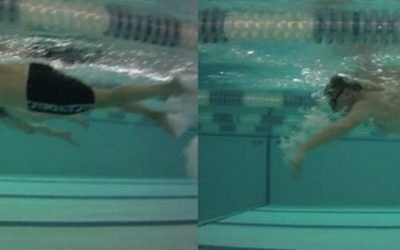 These small changes may be very subtle but the approximate the posture of full stroke swimming better than the “older” versions of the drill, and help to avoid imprinting cues that may lead to errors down the road. All drills compromise the full freestyle stroke and while understanding their benefits we should also try to minimize detrimental takeaways. 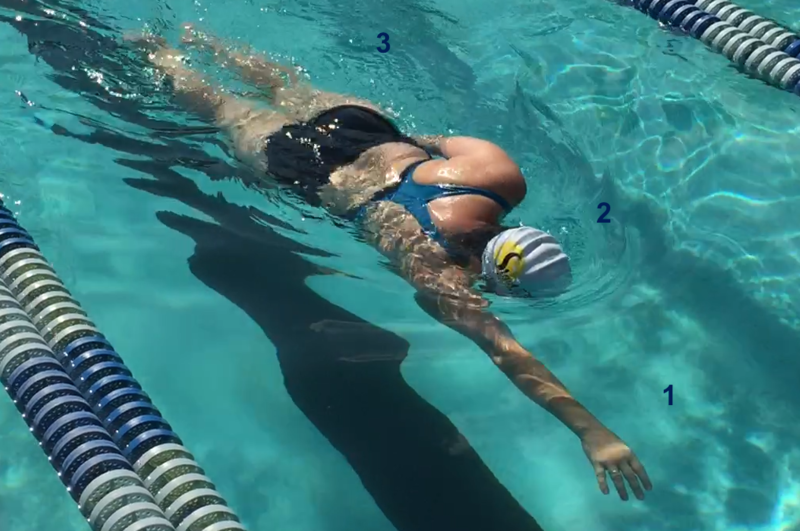 By making these deliberate adjustments, flatter rotation, gap allowed between the chin & the extended arm, and fingertips/palm tipped down towards the pool bottom, you can bring focus to each of these three areas in subsequent full stroke if you choose. I was always a math geek. Way back in 2007 or 2008 I took a clinic from Dr. Phil Skiba on periodization…but it was much more than that. 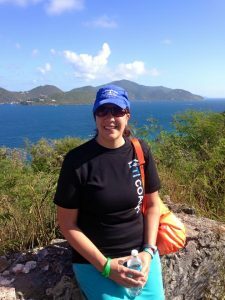 Phil is an experienced coach who also has a lot of expertise in physiology and testing. Phil’s clinic was one of the first times I can recall that the formal idea of a “time-distance” relationship in endurance sports was brought up in the context of how to coach athletes and interpret their abilities. I started experimenting with using this assessment in my own swimming & my athletes. Several years later I began combining this idea with what I had been practicing as a Total Immersion coach. I tried combining ideas that were well studied in traditional sports science literature with what I’d been doing in developing better swimming agility on my onw. 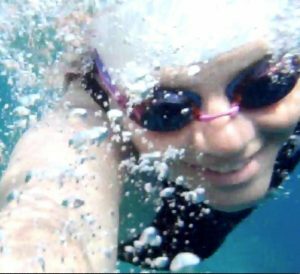 Shortly after experimenting with these ideas…in fact the very first day I used it in a group of triathlete swimmers, many of my swimmers set PRs for 50 & 100m swims just by refining and defining their control over their stroke. in 2012 I shared some of my thoughts on the total immersion website. I have often gone back to that thread to review what I wrote at the time as well as revisit the thoughts of another coach, Charles Couturier of Montreal, Canada. Charles is an outstanding coach at the University of Montreal and runs a large tri training program for people of all abilities. Here is the largely unedited text of what I shared that day in response to using CSS to train speed and pace. CSS is concept that dates back to at least 1965 when a distance-time model was prposed by Monod and Scherrer as they evaluated world records in swimming, running, speed skating and cycling. Since that time many sports scientists have examined and used the model to try and define specific stroke rates and stroke lengths in swimming, resulting paces, power targets for cycling and running paces. Swim coaches began using “Critical Swim Speed” as measured by using either a 400m & 50m swim test or a 400m & 200m swim test. The choice of distances affects the resulting slope & intercept (speed and anaerobic work capacity) as calculated by the model. In theory the shorter test, which taps into anaerobic energy stores, helps to “strip out” the anaerobic contribution from the longer test. The resulting pace represents an aerobic swimming speed that can be sustained for long durations by trained swimmers. I use the CSS concept to establish initial goals along with tempo & SPL targets for my masters swimmers who are new to pacing, or have not trained with me long enough to have a feel of their targets or points of improvement. by plotting a “long” and a “short” time trial test, the anaerobic and aerobic capacities for each effort are normalized. The above equation to determine the slope, removes the anaerobic component from the longer time trial (whether it is 300, 400 or 500yd or longer TT). In an activity lasting 8 minutes, even 20-30 minutes or more, a component of the speed comes from anaerobic muscle activity…brute force. 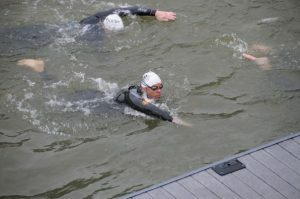 In the Total Immersion approach to swimming, this is vital because the intensity level is low enough to allow us to focus on technique improvements while swimming at a pace that isn’t “too slow” by anyone’s standards as long as the CSS was calculated from two recent time trials. We are left with what in theory, represents the highest aerobic speed a swimmer can swim, meaning that at this pace and anything slower we should be able to more easily implement technique changes and adjustments. 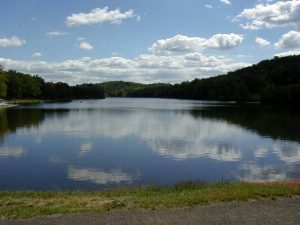 Just as you would practice a new or challenging passage of a piano piece or any other musical instrument slowly enough to allow you to learn proper timing & finger placement, an aerobic pace in swimming allows you to learn and imprint new and better neuromuscular pathways to make your swimming faster and more streamlined. Here is where the Total Immersion twist comes in…. With Total Immersion we focus on the neuro-muscular connections and movement pathways from brain to muscle. We can swim at the critical speed in many different “gears”, but we want to find the optimal gear, or stroke length and rate, that will allow the swimmer to work in a comfortable capacity while leaving ample room to grow in speed and get faster. Once I’ve calculated the speed with a spreadsheet I’ve set up to do that, I”ll give my swimmers a test set of 10×50 at critical speed + 5 seconds rest. Again I have this already set up in a spreadsheet so the set is ready to hand to them when they finish the test and I put the numbers into a calculator on my ipad. While they are swimming their 10×50 they count their average SPL. For some this the first time they have every done that, but it’s in the context of a familiar type of training…a time trial followed by sets at a prescribed pace. This helps people understand that counting strokes is not the same thing as aiming for lowest stroke count…we are just collecting information at this point. With this 2nd data points, average stroke count per 50 at their CSS pace, they are now honing in on a really valuable set of training parameters…not JUST critical speed, which can be swum at many tempos and stroke lengths (ie many different stroke techniques or GEARS) , but they are establishing an average SPL, which turns into as well as a target for improvement. After the 10×50 counting strokes, their next set (on a subsequent day perhaps), will be to use that SPL and the critical swim speed, and swim the long set again, but with focus on holding SPL at that average number and not exceeding it. What we’ve done is used the swimmers current fitness & ability to give them a starting point, without placing any specific focus on the swimmer adhering to SPL or tempo constraints while swimming the initial time trial. This allows anyone to do the set, not just people who are math inclined. I can take any of my swimmers with any level of experience, have them do the assessment set, plug their times in and my spreadsheet does the calculations, recommends the 10×50 pacing and the swimmer then begins their journey!